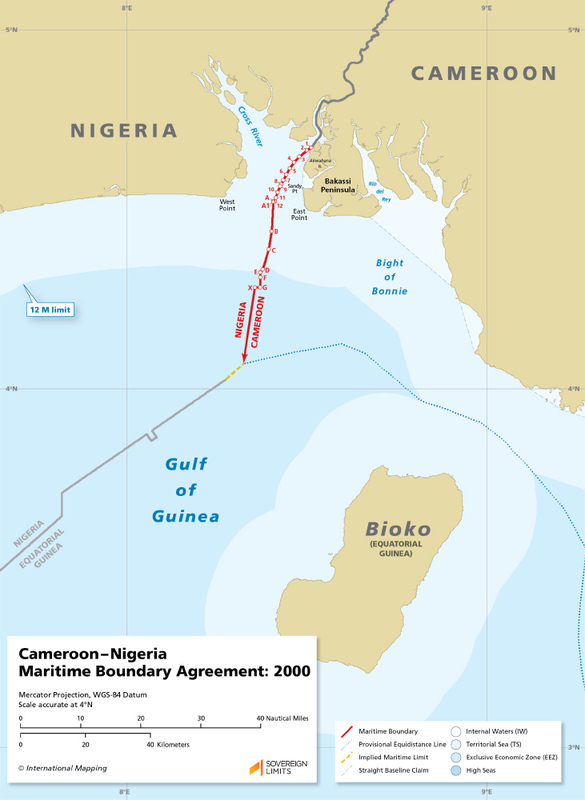 In 1994, Cameroon brought its land and maritime boundary dispute with Nigeria to the ICJ. Following eight years of litigation, the Court handed down its Judgment on 10 October 2002. The Court’s maritime boundary started at the land boundary terminus located in the Akwayafe River, and for the first 11 nautical miles it followed the “compromise line” that had been established bilaterally in 1971. From point 12, the border shifted to the maritime boundary that had been determined in 1975, following this line for an additional 15 M. The Court then delimited the seaward extension of the maritime boundary along a directional azimuth of 187° 52′ 27″ until the maritime entitlements of a third state would be affected, in this case Equatorial Guinea. In 2007, a Cameroon–Nigeria Mixed Boundary Commission transformed the coordinates provided in the Court’s Judgment into the WGS-84 datum.